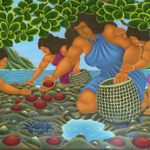 Volcano Art Center Gallery is honored to present a unique collection of original paintings by the beloved Big Island artist Dietrich Varez in an exhibition titled “Timeless Treasures.” The exhibit, open to the public on January 7th, will continue through February 12th, 2017 at Volcano Art Center Gallery in Hawai`i Volcanoes National Park. A special reception honoring Varez and his art will be held on Saturday, January 14th from 5-7pm. Dietrich Varez is best known for his extensive collection of linoleum-block and screen printed images of which over 250 have been published. He typically begins each image with reading and research. A particularly colorful or visual passage in a legend is often the stimulus. Based on oral traditions, some of the images can be viewed as the first visualizations of these myths and legends. 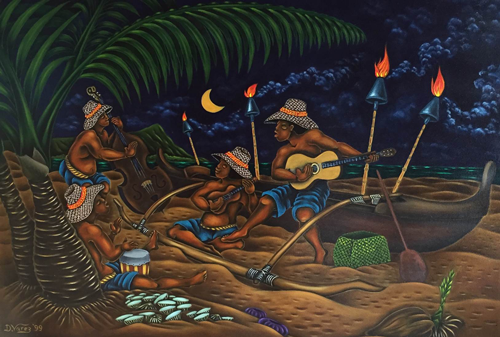 Shunning publicity and working in simple fashion Varez shapes his strong personal expression of Hawai`i. By nature, a quiet and private man, he lives with his wife Linda (also a noted painter) in a remote rain forest setting near Volcano on Hawai`i Island. Several miles of poor roads preserve the tranquility and privacy he desires. For over 40 years, Varez produced new print images each year, personally printed each image by hand, refused to number his prints and maintained extremely affordable prices. In Dietrich’s own words “I’ve made many fans and friends abiding by this philosophy of availability. Prints make it possible to bring art into the life of almost everyone.” As of June 2016 Dietrich has officially retired from his printmaking process. His print images will continue to be offered as fine art giclee reproductions and still at affordable pricing. The remaining hand pulled prints by Dietrich himself are available in limited supply. “This exhibition will highlight Dietrich Varez’s original paintings,” states gallery manager Emily C. Weiss. 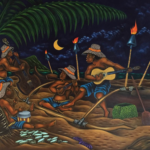 “Although not as prolific as his print collection, Varez’s colorful depictions of Hawaiian traditions, life and legends provide audiences an authentic visual expression of Hawai`i Nei. Since his retirement from printmaking, Dietrich continues to paint and write. 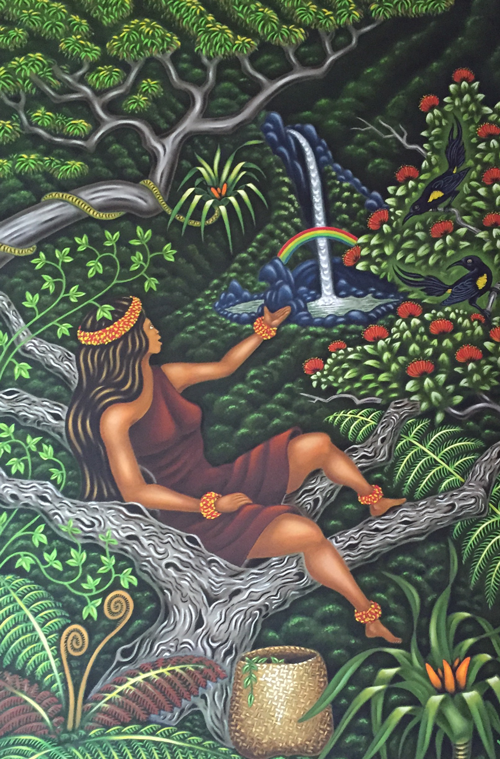 In fact, a second edition of “Legends of Maui; A demi-god of Polynesia and of his mother Hina, with prose by William D. Westervelt and illustrations by Varez is due out in early 2017. If possible VAC will feature the book published by Petroglyph Press at the exhibition,” states Weiss. In typical Varez fashion, he will not attend the reception in his honor. 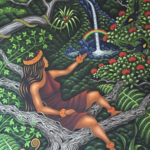 Volcano Art Center encourages all those who have been touched by his story as told through his prints, paintings, books and illustrations to visit during the show. VAC will be collecting sentiments of appreciation to share with Dietrich and Linda. 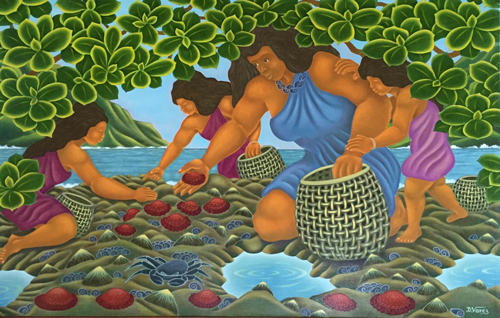 A true artist of and for the people, Varez has carved a deep understanding and appreciation of Hawaiian values and lifestyle that can be learned and perpetuated through his art. The exhibition and reception are both free to attend; however, park entrance fees apply. 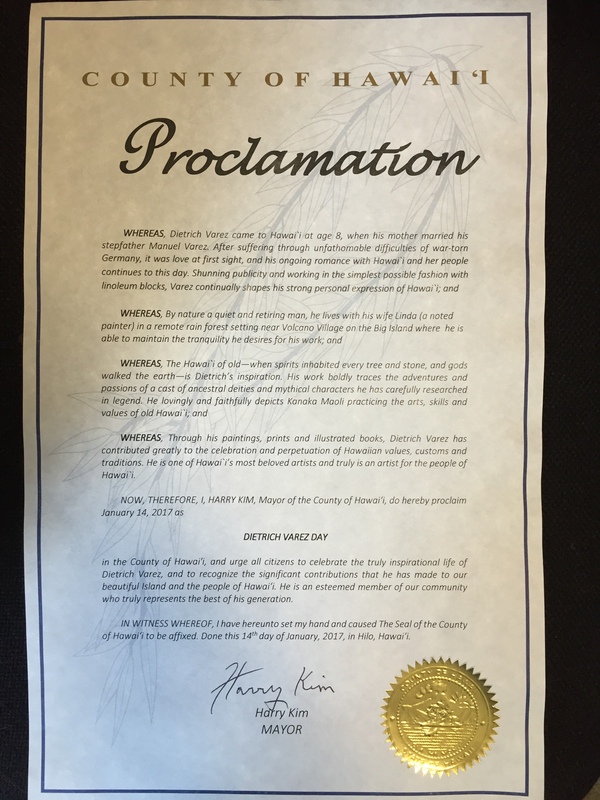 Volcano Art Center wishes to congratulate Dietrich Varez on his official Proclamation from the County of Hawai`i. 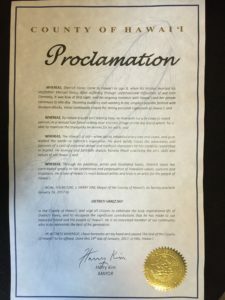 Mayor Harry Kim has officially declared January 14th, 2017 as Dietrich Varez Day!